Mumbai Metro Line 3 successfully conducts its first twin tunnel breakthrough at Dadar Metro station. 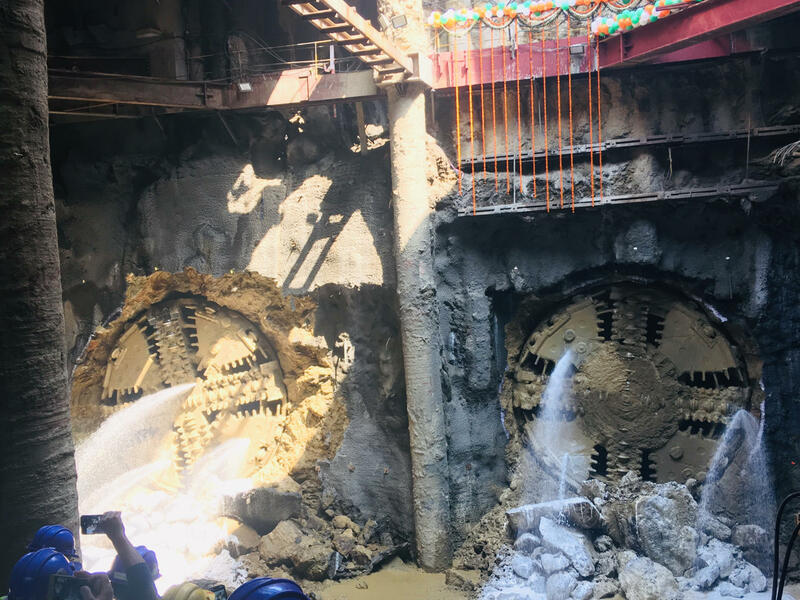 Twin tunnel boring machines Krishna 1 &2, lowered in Sept & Oct 2017 respectively from Nayanagar, Dharavi, reached Dadar Metro station on January 31, 2019. Mumbai, Metro Rail News: Mumbai Metro Line 3 (Underground Metro) 18 km of tunnelling complete. Twin tunnel boring machines Krishna 1 &2, lowered in Sept & Oct 2017 respectively from Nayanagar, Dharavi, reached Dadar Metro station on January 31, 2019. According to source “Krishna1 & 2 made their way through the rocky strata made of Basalt grade 3 & 2, breccia grade 4, 3 & 2 and tuff grade 4 & 3 drilling relentlessly for exactly 506 and 479days respectively. They charted their course from Nayanagar launching shaft. The 108 meters long Krishna 1 bored, on an average, 10 to 12 meters daily shaping the tunnel with 1779 RCC cement rings, whereas The 108 meter long Krishna 2 bored, on an average, 10 to 12 meters daily, with shaping the tunnel with 1766 RCC cement rings. These TBM’s were equipped with Earth Pressure Balance Technology. Overall 35% work has been completed till now. MMRC successfully conducts its first twin tunnel breakthrough at Dadar Metro station.